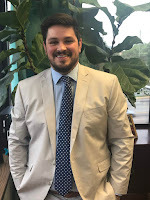 Pee Dee AHEC welcomed Matthew B. Peake as their Health Careers Program Coordinator in May. He comes to Pee Dee AHEC from Florence School District One, Southside Middle School, where he taught history and coached the boys’ soccer team. In addition to his Southside Middle School commitments, Matthew served as a homebound instructor, advisor for the afterschool program, and a member of the National Network of Partnership Schools Action Team and Young Men of Character. A native of Mayesville, South Carolina, Matthew received his Baccalaureate Degree in Religious Studies from the University of South Carolina. He and his wife Katelyn are the proud parents of two sons: Grayson and Ayden. His hobbies include experimental cooking, coaching soccer, high school wrestling and home improvement projects. Please help Pee Dee AHEC welcome Matthew aboard by contacting him at 843-777-5351 or matthew.peake@mcleodhealth.org.